Seller: Papa John's International Inc.
© Papa John's International Inc. I order from the App every time regardless of where I am in the country! Love it! The app is very easy work with especially payment with Apple Pay. Love the pizza and delivery team .. wish the app would let you upgrade pizza size to XL..
Makes it so easy to order whatever you want! I order pizza probably 3x a week and the app has made things super simple !!! Only thing missing is a status timer. Just click and go. And it keeps track of my rewards. Thumbs up! App makes it easy to order, and you can earn free pizza. Love easy apps. Everything was easy. Even the promo codes. Wonderful! Never have a problem with ordering and it remembers my info. Super easy to use. I had an alert that I would get a free 1 topping pizza, and at checkout it didn’t give it to me. Easy to use and always full of great deals! Easy to use app stores past orders, addresses, cc, etc. Makes reordering easy and convenient. Lovvvvvveeee the pizza, chicken poppers, cheese sticks, etc. just yummmmm. Love it!! So easy and quick to use and place an order! Super easy to use and even easier to pay. Easy to use. The only way to order papa! Really works well and u can skip the hold on the phone deal!! Nice little app, but it keeps forgetting my info and losing my points. It is quick and easy to use!!! We order weekly and this store has the best service and quality in the area! I’ve put over 10k in this app lol best pizza around me! A lot of food delivery apps are absolute trash but Papa John’s is great so far. Simple and clean. Pretty easy to use and it’s faster than using the website. Love to pick date and time. App provides all you need. Works flawlessly most times. Papa Johns is the best. Always hot and always fresh. The order is always correct. Gotta love them. Handy, but if you are doing carry out you can often get a better deal by calling store direct. The app makes it so easy to place your order. Keep up the great work. I love the track my pizza it’s fun to watch and I’m always right on time to pick up my pizza!!! 2 large any pizzas for $20 great deal!! Love their pizza and their app!!! I use it all the time. Very easy. I’m actually just using it for the first time. It’s really easy to use and very convenient. Makes it easy to order what you want!! Super easy to use. Very user friendly! I have no problem with the app. Order from the menu or build your own. Works great. I use it a lot. Could be designed better. Call me and I will help. Improve the app flow and improve revenue. Convenient Ease-of-use Rewarding after repeated use Thanks-a-billion! The app is very convenient and easy to use! Easy to use to place orders! Easy to order what we want. Who could ask for more? Nice and simple. Keep it up! Easy to use and very organized. So user friendly and easy to use! Always excellent service and excellent pizza! Really enjoy ordering pizza from the app. Takes minutes and I earn points!!! Easy to use and has very good deals. Very user friendly. I like that it offers rewards points for a free pizza. Very convenient. Easy ordering using the app. Makes everyone happy every Friday night. Recommend for sure. Honestly. I didn’t do well before. But an employee helped me and now it’s great ! Always easy and fast to use. Deliver is always on time and pizza is always very good. Excellent service, never over cooked,and always hot. Nice delivery people too! Love the app just wish the rewards would show what we can get. Good flavors. Quality thin crust. The app is easy to navigate. Card data stored makes ordering easy. Love the Italian Hero ! Love this app. Convenient and simple. Works as advertised. Pick what you want, order pizza. Simple but through! It works! No hassle! The app is easy to use and runs pretty smoothly. I haven’t had any issues. Works like it's supposed to. Haven't came across a glitch yet used it a few times. Super strait forward and dumb friendly a lot easier to customize and at the same time you gain rewards so why not!!! Papa John’s app is so easy and convenient. I love how easy it is to maneuver around the platform. And I love the rewards. No problems with this app, and it makes ordering very convenient. The app is only reason I order their pizza. It’s easy to use. Building an order is easy and in that way the app is great. But there needs to be a feature to help with orders that have something go wrong. There’s no way to tell if something has gone wrong with an order on the app. I’ve had an order messed up twice now and no way to easily let someone know at the store. Just don’t forget the 2 liter! They have done a great job with this app! I love how I can tip someone before they get there and how the rewards system is perfect. I can get a free reward every month if I order every week for pizza night. Thank you for taking the time to make the app amazing! Excellent Pizza and quick delivery! I love ordering pizza when it’s fast and easy. This app glitches too often and doesn’t allow me to login. Then says my password is incorrect. App easy to use. Wish there was a way to track the order progress. Would better judge pick up time. It would be good to know delivery time of order. Good transitions and easy to use. Your app has been a breeze to use with the $10 pizza deal. Thx Papa Johns! When I think Pizza, I think Papa John’s! The new Hero pizza is AMAZING!!! 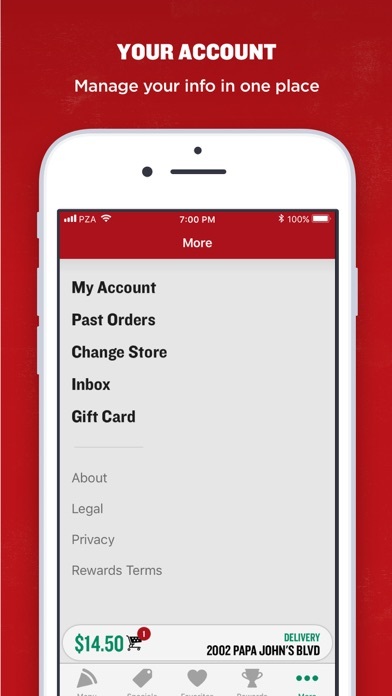 App makes it easy to place the order online for delivery or pick up. I love the tast of PJ... I just wish there was better deals/coupons but other than that great food and excellent service!! I order from store #550 and they made my XL pizza with L dough because i paid less for the pizza. They were not cool and have bad ratings on google. You store my favorites, track my points and so easy to use when your hangry! I order pizza once a week and it makes my life sooooo much easier. The specials are right where I can see them, it keeps track of my rewards (hello FREE pizza) and it stores my payment info. Literally the easiest way to get fast dinner in a pinch! Makes everything so much simpler & quicker! Great app makes ordering, logging in and earning rewards so much easier & faster! This pizza is amazing, it’s my favorite pizza place. The food is always on point and the deals are a steal. Stores all my info, no need to login every time. Makes ordering fast and convenient!! Great for a busy working mom!! This app has finally reached the minimum level of acceptability. It would be great to be able to repeat a past order with only a single click or two and not have to re-verify payment method every single order. Apple doesn’t do it that way !!! PJ’s app is dope AF. It never goes through the first time!!!! The app always stops processing during the payment process. Always have to re-enter the payment informations!!!! Now we can’t even include the tip on the credit/debit card. Really bad!!!! May have to get pizzas from someone else that likes our credit cards for full payment including tip!!!! For some reason the app keeps telling me through an error message that the papa johns doesn’t deliver to my location. On base. In the residential area. With a papa Johns ON THE BASE! They in fact deliver to anywhere on the base! Fix the bug keeping me and hundreds of others on base from ordering through the app. Don’t believe me? Call the Nellis AFB papa johns and ask them how many times we complained about it. But who knows... Maybe ol kapernuts broke it to further screw the pizza company... SMH. Works great! My fatass uses it all the time so 5 Stars. Won’t let me use my reward points for anything but a free pizza. Love how quickly they deliver and just like we ordered! Always a win! Well it’s better than calling in. But it won’t let me reenter the track my order option if I leave the app to do other things while I wait. That’s why I only gave it 4 stars. Great pizza. Better app. Easy to use and functionality is great. Keep it up!!! I dislike that I am not able to add tip before I check out when paying by credit card. Love my app and it’s great to use!!!! The ap developers appear to have gone intentionally out of the way to ATTEMPT to trap a customer into ordering more unwanted items rather than making it easy to use a promo code, then easily being allowed to leave. Thanks for the frustration, Jerks!!! Use the app all the time!! It’s great! We have switched from mom and pop shops to Papa Johns. I love their app, rewards and the prices! Like the app, but I wish there were more good promos to use. Super easy ordering and viewing deals! Thanks for delivering to our area. Really enjoy the Papa John App. Makes ordering easy. Love the fact I can order and set delivery time! I love how easy the Papa John’s app is to you & it’s my favorite pizza place to go to. I’ve ordered from multiple locations & the quality is always great! It is s nice way to order, but it doesn’t always allow you to include your tip in the application. I little inconvenient but it could be fixed. I like Papa Jons, but unless I have a discount code, it is waaay over priced. It’s stupid having to have codes to get a normal pizza price. Wonderful pizza!!!! I love their app. It’s so easy to order. Never had a problem with delivery service. Would like to be able to order more than one dessert. This app is super easy to use and the updates are always useful and continue to make it easier and better. Highly recommend!! I held off rating this app to see consistency, this app is quick and easy, I have never had a problem with it. And pap johns Service is awesome! It is convenient and easy to use. Very user friendly app and easy to understand. I would appreciate being able to order specialty pizzas with my rewards through the app. When I wanna submit account asks about address which I can not find that option! Makes ordering pizza pretty easy. My son and I enjoy papa johns at least twice a week!! App is easy to use and navigate through. I use every time I place an order. Deliveries are always at my door at or before promise time. This app makes it very easy to order! Love the convenience of the app! And the great promotional codes. Have used this app many times now, love how easy it is to add coupon codes and customize deals. Eazy to order and confirm what you want. I love Papa Johns!! I used to not like Papa Johns but the North Canton store changed my mind when I moved here! I love their app and it makes it so easy to purchase online and they are right on time with the Pizza Tracker too!! I’ve never had any issues with how my pizza comes either! Never a bad pizza with them! Absolutely delicious! It's a def improvement on previous versions. Easy to use app and great deals!!! We love this pizza! 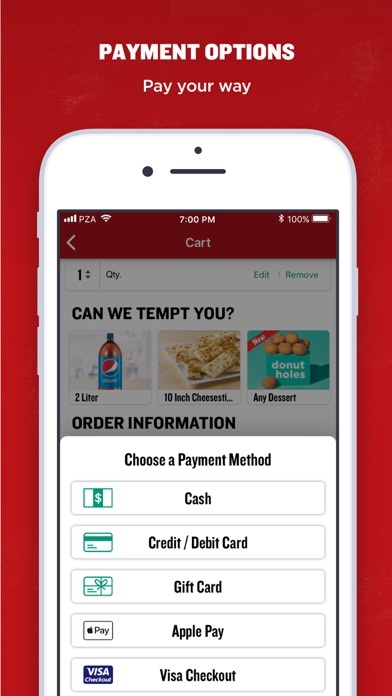 Papa John’s app is extremely easy to use and so convenient! It’s easy to shop through the weekly specials to get the best deal and there’s also an option to repeat past orders which is very convenient if you always order the same thing! 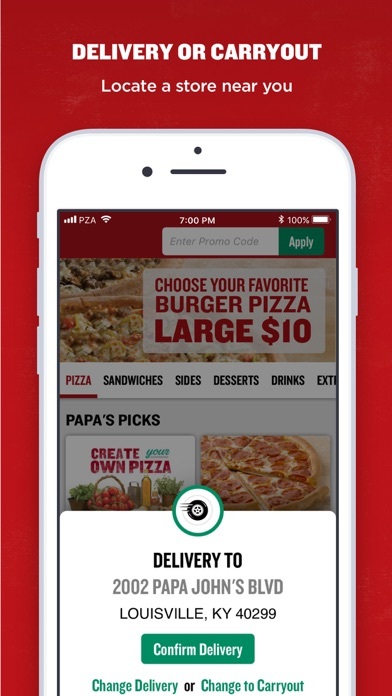 The convenience of ordering through the app is one of the main reasons my family orders Papa John’s over other pizza places in addition to the great taste of the pizza! Accepted my promo codes. Logged me in. Allowed me to customize. Took my payment. Nice to know I can do this on my way home timed to swing by and use carry out. Easy app to use and I always order super fast!!... I love the tracking tool as well!!... Great app all around! Order was canceled why? On phone 10 min? No one at corporate pick up phone to explain why my Order was canceled! That’s not acceptable period. Placed order again this better get delivered! Promo codes are offered frequently, and app is easy to navigate. Always in a Papa Johns mood!! Best Pizza in town! This is a great reward system! Pleasant surprise to find a free pizza in my inbox! I am a college student so free things are always excellent! It’s a great app to order simple things, although if you want 1/2 and 1/2, you might as well call. When I selected all my options I couldn’t figure out what to tap to check out! No where did it specify ‘check out’ or ‘cart’ in words. I finally tapped the cart icon and it went to the cart. Great pizza and easy app to use! The app is slow. But very convenient. It’s pretty easy to use and it doesn’t really take long to get a pizza. The app is straight forward and easy to use, but has some issues. It always logs me out, doesn’t save payment info, and takes me through the process of adding my delivery address in several times. App is cool, however I always get reminded to rate their app- and it’s already rated ?? Also the food is usually late , Take 60 mins + for a pie. Awesome app!!! Makes ordering super easy!! Application is very responsive, no lag and have not experienced a crash yet. My girlfriend and I have to switch between which phone we order on because the order fails SO frequently. Also, the app has sent our order to stores 40 minutes away more than once. I wanted a light amount of pepperoni instead of the normal amount, but there’s no place to add a comment to communicate this. The app should tell me an estimated wait time on delivery BEFORE I submit payment. If I had known there was over an hour wait I would not have placed an order. App has a few quirks, but simple to use once you know them. This makes ordering pizza sandwiches easy and I can specialize everything. Love it. Papa John’s is delicious! Love the garlic butter sauce! And the free large one topping when you order on the app with code BETTERTOGETHER!! Easy to use and great deals! The app is so easy to use! Makes ordering my favorite pizza simple and fun! Thank you Papa Johns for going the extra mile! Quick and easy. No wait or being put on hold! I love it! App is easy to use and delivery is reliable and accurate. It makes ordering a pizza fun and easy. With all of the menu options and easy ways to customize, it makes for a perfect way to order your pizza just how you want it. Not to mention having the option to pay online or when your pizza is delivered. Super easy to use and explains everything from when you order until it’s ready and on its way to your house prices are good and the deals are even better. It’s super helpful that the app remembers my favorite order and my credit card which makes the whole transaction so much easier and quicker. It’s also really easy to apply coupons and check out deals. The only problem I have is there isn’t a way to add extra sauces to my order because I love to get extra garlic sauces. Other than that I LOVE this app. Always makes so much easier than calling or using internet. Tells you exactly when they’re making, cooking, boxing, etc the food. I love Pizza and this app makes it even better. Me and my family have a tradition of ordering a pizza every Giants game. Sure makes it easy using the app, as well as calling there or walking in. Love the food, but especially my delivery people. They are always making sure my order was correct. Takes forever to check out because half the time it doesn’t work and doesn’t let you check out. The only two things I’d change about the app is to be able to substitute sauces on your pizzas. We do not eat the garlic and would love ranch. The other option is to fix the rewards section. It will only allow me to be rewarded for a pizza (25 points). I receive emails to where i qualify for sides and deserts but once i sign onto the app it doesn’t allow me to choose one of those. If i am over looking either one of these options please let me know! Thanks. Love the papa John’s app! When I’m having a long day I can order my family dinner with a few clicks! Also love redeeming my points! I really don’t appreciate that the app only tells you how long it’s going to take for your pizza to be delivered AFTER you place the order. Love using the app and getting points! We use it every time we order pizza. I use this app all the time and it works every time. I'm a sports fan so the fact that Papa John's apps tracks my sports teams and provides incredible savings plus PAPASLAM is reason enough to love this app but couple it with delayed order delivery and customization simplicity and it has now become my essential spontaneous entertainment solution mainstay. Enjoy! I love using this app. It is simple and quick. Being able to have your favorite emergency order ready to go with the touch of a button... it’s... it’s... just amazing! Always happy when we order. Our go to for pizza delivery! Very easy to navigate app! This app is easy to use and easy to understand. It make ordering pizza 10 times better. Amazing app love when I get free pizza from reward points!! When the app works it is a great way to keep track of the specials going on in your area and it makes ordering very quick; however, the app is linked to the Papa John’s website so if it goes down so does the app. This happens frequently so while I would love to rate the app higher I cannot given the fact that it only works about 3/4 of the time. Convenient, works, and Good Deals! Ordering online works great! And, they offer special deals for ordering online much of the time. I like the app. It’s easy to use, It detects your location for closest store. You can use your Apple Pay to pay at the end. Convenient. I never have any complaints even late at night! We order a lot of pizza but I would say that 20% of the time when I select the cart to checkout it asks me for delivery or carry out , then asks for the address and when you select it the screen just goes back to the menu and doesn’t continue with the checkout process. You try again over and over and it won’t work. Just keeps looping. Eventually I have to close the app and restart, which then I have to reorder my entire order again. Sometimes this works and sometimes it doesn’t. I am a programmer and this behavior is totally unacceptable for software with the sole purpose of making a sale. Someone needs to find the bug and correct it. I love how user friendly it is. Even my 80 year old grandmother can use it. I love your pizza. Never lets me down. Very easy to place orders! And great way to earn free pizza! Easy to use and fast! Great app!! Overall a good app, however, sometimes it doesn’t work properly and I️ have to restart multiple times. And if you keep ordering you get a free pizza lol !! Easy to use and setting up order is fast. Overall easy to use and super convenient for making quick orders with great deals. Easy to navigate application. Good job! Great pizza on a great app. I return to my car at the airport, pop in my order in a flash, and it’s ready down the street from my house when I get there. It doesn’t get any easier and better than this. My store is awesome... that’s why I TRY ( no matter how much) to tip my drivers... even if they mess up a little.. no body is perfect, right? The good certainty outweighs the “bad”... so to say! Super User friendly, great prices, works for IPhone and Droid!!! Always fresh! Customer Service is exceptional as always. Location knows us by name. We don’t have many places to choose from when it comes to good pizza. Papa Johns is by far the best out of our three local choices. PJ's is our family Friday feast and has been for years. What would we ever do without the papa john app and, as our 4 kids call it, Papa J's day!!! Thanks so much for the great pizza and the great people who cook and delivery it. It's our favorite! Ap works just fine. I like that I can use Apple Pay w it. And the gf pizza is the best I’ve had anywhere. Great app! Easy to use and love the deals! Also my fav pizza place. Keep doin you Papa John’s. Frequently loses address during order, but also sometimes shows any address used in last 3 years seemingly at random. No edits made to the account (including deleting/editing addresses) is saved in the app or reflected online. A lot of information seems to get lost between me placing the order on the app and what the store receives, making it a very poor experience all around. It’s the best pizza in the Valley! Works great every time! Easy to use! Love it! Super intuitive and easy to use. For some reason I typically get overwhelmed when trying to order pizza online, I’m tired, I’m hungry, I’m easily distracted... but not anymore. I am VERY happy with Papa John’s app. My only issue is that they don’t have a way (that I could see) of substitute ranch for garlic butter and add Parmesan aside from in the comments, which I tried, so we’ll see if that works. Overall, I am very pleased. I use the PaPa Johns App because it’s quick, easy, and convenient. You can see your reward points, specials, and customize your order as well. Great pizza with better ingredients. Really is coolest pizza app. Easy to use. Great pizza....great delivery drivers....don’t get to talk to anyone else cause the ap is awesome!!! Love my Papa Johns!!! Check out was a bit confusing. Maybe one of the most unintuitive apps I’ve used. It took me 10 minutes to figure out how to check out. Clicking on the shopping cart gave me the option to enter an address, which I did, then it took me right back to the beginning. I ended up making an account (which I didn’t want to do) so I could stop typing out my address every time. I’m still not sure how I got to the check out screen. In frustration, I just started jabbing my finger at the screen and it eventually worked. What garbage. I love the app!! Easy to order!! It has been at my experience that the Papa John’s app for ordering pizza was one of the worst in the business. It has since improved but is still challenging. I’m a big fan of Papa Johns Pizza but they need to make the App alittle bit more intuitive. I actually got a promo code and it worked I saved almost $20 on my order thank you. This app is alright, works 99.99% of the time. Would suggest using it. The app is easy to use. I love that I can store my favorites for easy reorder. If I have have to make a recommendation, it would be for easier password recovery. I was logged out and could not remember my password. I couldn’t get in to order through the app and didn’t wasn’t able to log in until after my purchase. However, I made my purchase online, but didn’t get the reward point for it. I cannot say enough good things! Best pizza & best app. It’s a no-brainer! It’s a good looking app that works well. It’s much easier to use than the website. I've been using this app to order my pizza for a long time. It works very well and keeps getting better. I LOVE THIS APP MAKES ORDERING SO SIMPLE!!! With GPS I don’t understand why the delivery guy always gets lost!!!! I like the app it is easy and the pizza is fast! We have a busy schedule and always live the choices and convenience. They have lots of variety and love the new choices they have frequently. They always arrive on time too ! Easy to use and very reliable! I prefer this than calling!! Thank You!! I LOVE THIS APP!! I use the app and it works well! Great app. Easy and efficient! If you enable notifications in order to get updates on your order, they abuse that privilege and spam your phone with marketing content. Easy and use and very convenient. Always comes in handy when you need to order up some food for the friends and family. Fast ordering and best pizza everrrrrrr!!!! The most delicious pizza, great prices and comes with garlic sauce for no extra charge. What more could you ask for?!? Very easy to navigate and it saves your previous orders. The Papa Johns app is ok. It’s not great by any means. Once you select your size, toppings, cheeses, etc, if you want to review, sometimes you have to start over. This app is easy to use makes ordering Papa Johns a breeze. Plus you can earn free pizza! Overall the app is good. I do have one recommendation: The app should allow for special instructions or options like double cut the pizza to make 16 smaller slices instead of 8 regular slices. 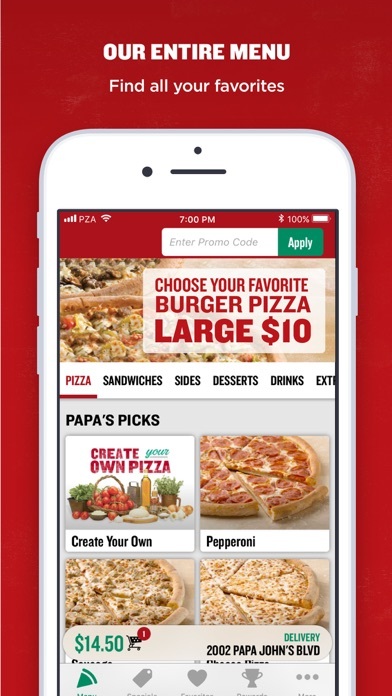 We love Papa Johns and this app makes it so easy to order! Easy to use. Works every time. What more is there to say. Does not flow easily. Have to repeat steps and sometimes start over. Cannot add 2x cheese You ask for unnecessary title to do your survey and everything seems tone taken. Have tried 10 so far. Change to 1 Star. You must make it impossible for bad reviews to get through. Very easy to order, see the specials, and edit your toppings. Great app overall, and I really like the pizza tracker feature, but if you close the app or navigate off of it within the app, you can’t get back to it. Great service and great taste! What can I say, it’s Papa John’s! The best there is for a chain store delivery pizza. Pretty self explanatory in the title. The app is so easy to use! Love the rewards and the specials! My kids love tracking the pizza too! I use this app for all our pizza orders. It’s great. But the last update has made it so I’m no longer in a delivery zone for my local papa john’s. I went to the store to also a carry out order and the manager assured me they haven’t changed their delivery area. He said I’m still in their area. But the app refuses to recognize my orders. Very disappointed. Love the app and the pizza! I feel like it takes forever to order food online. Love yalls pizza though! I've been eating Papa John's pizza since I was 14 years old. My family loves it! Love your pizza, specials, and mobile app! Checkout button not totally clear but good app! See title - checkout button needs a little Help I think in clarity. App is functional, simple to use and I have had no issues. So easy to maneuver in the app and it give you the option to change anything and everything you need! And the rewards are awesome I forget about sometimes and then I am able to order all of dinner for FREE!! I use this app instead of calling. Always correct!! Love how simple it is to order and track your pizza from this app!! And great pizza. Love PJP's! Using the app isn’t very intuitive, but once you understand the process it’s very quick. The app tells you when your order is ready for pickup. Nice. Love the app, much better than using phone! Quicker service! I love this app, I use it literally every time I order pizza and that’s at least 2-3 times a month. My problem is that once you place your order it gives you the time of your order and shows you if they’re making it or the whole process. If you accidentally close the app it will no longer let you somehow go back to that page or track your pizza it will just let you start a complete whole new order. I wish there was a place on the app where you’d be able to close the app and re-open it and be able to track your pizza. Other then that it’s pretty self explanatory. I love how easy it is to order, and I love the pizza tracker, but after a little while you can’t track the pizza anymore. It just disappears from the app. I would like to track all the way to delivery. App is easy to use and fucnctions well. The staff that I go pick up from are incredibly friendly and make it worth goig to there location! Trying to select Minot Air Force base on the app does not work. You can look it up and select it, but once you select it and reach the final step it tells you order cannot be delivered. This app is simple to use, and works great. Great App! Quick & easy way to place and track your order! The app also lets you know about their great deals if you turn in notifications in settings! I love papa John rewards and getting a free pizza when I am low on funds. Papa johns is always great! The pizza is always cooked perfect and also the cheese is stringy when you pull the slice away from the pie! It’s a use friendly, easy to order from. Never had a problem ordering or paying. The app is very easy to use. Only once have I made a mistake using the app. I like this app and would recommend it. Has worked flawlessly for me! Keep up the good work Papa!! This app is very user friendly. No bugs, no issues and compatible with Apple Pay and Touch ID. Pizza Huts app is garbage and Dominos, while better than PH isn’t nearly as great as this one. I love that it’s connected to Google Maps so your address is always a simple process. Honestly it’s the sleekest app for a quick bite. 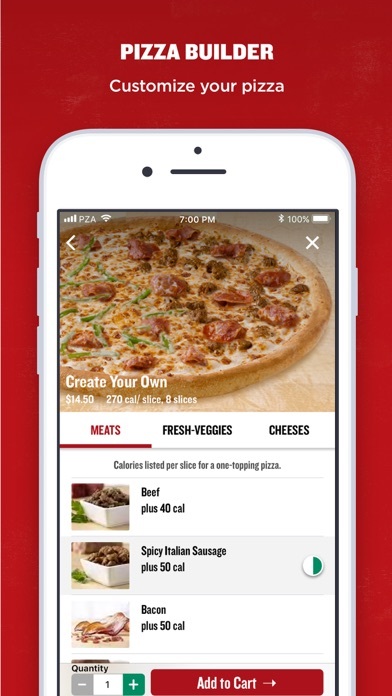 The app should naturally jump from meats to veggies and then cheeses. Currently when you continue after selecting your meats, you skip being able to add veggies and cheeses. Easy to use and very fast way to order some pizza. Plus the tracker is great. I really like this Papa Johns! I always order from here never had any problems with my food at. Customer service is great too, always a pleasure doing business with this store. Easy to order, minimizing my contact with people. What's not to love? Easy to use. Very fictional! Excellent way to order food. Better ingredients Great! Pizza !! Great way to order pizza. Seem to have issues using saved card unless I re enter it to order. Otherwise I love it. Easy to navigate, customize and order. I always enjoy using this app especially when I’m headed out with friends I need to order pizza for the kids at home. So easy. Love it! Great app. Orders are always fast and never have an issue. It would be better if your worked!! Me and my son love you guys. From the way the pizza tastes to the points you received from ordering is just awesome... the only thing I can say that really bothers me is that you guys don’t provide plates and napkins. Easy to use and love the awards! Love the new app. Much easier to navigate. I buy Papa Johns all the time because it is so easy to order on the app and the pizza is delicious! Easy to use works great:)! Best Pizza I ever ate from anywhere! Excellent delivery service and great special prices! I love dish pizza and plain wings. Every since they updated it to included the updates on when it’s out for delivery it’s been more helpful. Easy to navigate, saves you information, makes ordering quick and easy! Super easy and convenient! Every pizza lover needs this app! Been using this app for few years it needs to be more user friendly don't like that you can't go back and edit you have to start over again. And you have to go through all pizzas in order to get to small size. This app needs to be updated to faster features! It won't store my location I have to choose it each time! Pizza is great just need better app! I WANT PAPA JOHN BACK!!!!! I use the app frequently to get a quick meal for the family. I order up our favorites and pay online or at the store. Definitely recommend! Very easy to use, easy navigation, user-friendly & never had any issues. Use this app at least three times a month. Easy, visual app for ordering pizza. Accomplishes what it needs to with minimal problems. I love using the phone app. It makes my ordering fast and convenient. I just love the pizza here. The app is great never any problems. The points are my absolute fave just got to my free large pizza ! This app is so convenient when I am craving the Papa! Love Papa John's! Love the app! It's so easy to use and with everything I need +more! We used to order dominos but since we have tried papa johns there’s no going back we are in love !!! Would be a better app if when you wanted to change contact info you could save it without getting error message about your password not being right. Always friendly staff and super usable app! I love Papa Johns it’s the best pizza place. F**k Pizza Hut, Dominoes, Cici’s Pizza , Lil Ceasers, and whoever else I left out!! It’s simple yes and fun to use. Plus you earn free pizza over time. And I order a lot of pizza. This app is simple and quick. The best part is tracking your order from the moment you place it until it arrives. The rewards are just as easy to track. This app isn't that great, tbh. The website is much easier to navigate. However, I get free pizza with the app (code "BETTERTOGETHER"), so I'll take it. Keep doin your thing Papa. I love that you can track your delivery. The food is always hot and fresh and delivery drivers are friendly. Works great! We use it all the time! App is easy to use, convenient & always available. App is easy to use, it's really simple and uncomplicated. I stay signed in so I don't have to remember my passcode. You have the ability to save your favorite order. You're points are accumulated for you and they're easy to apply. Bottom line, great app! Can’t get my code to work. Very irritating. Not good for repeat order. Should only require a few buttons. Pretty reliable app, suggest building design with drop and drag toppings that customizes picture of pizza as you build the order. Also, would be nice to get notification of estimated time of completion for carry out orders. Great pizza and tuscan cheese sticks are awesome. Great for convenient and quick ordering. Pizza is usually here within the time frame and very good. App is great and user friendly. I am pleased with the whole selection and delivery, I’ve always had everything delivered correctly I have no problem very satisfied. Papa johns pizza is the pizza for you and me. Got dat free pizza wid my points. It’s lit! Easy way to find deals. My children won’t all eat the barbecue and red sauce options; so, I always have to call in after putting an online order in to have them put the garlic sauce on it instead. Why the app does not offer that as an option is beyond me, especially when I can call and request it. With my busy schedule, it would be nice not to have to keep calling him. Make it easy to place orders I can order pizza in California have it delivered in Florida . App is mostly fine, except for the tracker can’t be opened from inside the app (at least I can’t figure it out). Only way to get it is to go to the confirmation email and open the link to it. Otherwise isn’t to hard to figure out. Very simple and makes ordering so easy. Love the ease of pizza customization ! Best pizza and fast delivery! This is the best way to order pizza and you can order it at noon or any time to be delivered at the time you want. I must say that this is the best pizza I have ever had. The pizza not only looks great, but tastes even better, not to mention, the staff is super friendly. The service is always quick and I always get my pizza hot. I have never been disappointed. I highly recommend Papa Johns Pizza! No issues, easy to use. I like that it saves my info, quicker for my next order. But It’s messed up a few times when I’ve tried to enter codes. It’s still relatively new so it’ll probably get fixed soon. My god words can’t explain my frustration. Great Quick Pizza Ordering App! I always sign in and it kicks me out in the middle of my order. Way better then calling and dealing with someone on the phone. Fast and simple. If I can use it, it's good. This is a fairly good app except for going back to revise an order or ordering extra cheese. Would definitely use again if my store can get their act together. Love the app, can I have dinner made and on the way within a minute. Could use repeat last order button, or did I miss it? You have come a long way with the app! Good job and thank you BUT bring back option to tip at check out!!! Easy enough to use. No complaints with the app. Love that the pizza tracker was added! The app runs so smoothly and is so easy to navigate now! NY pizza snob says yes! Although I expect no one to meet the expectations of a pizza snob such as myself, I give papa johns high praise for having it SO together regarding their order and delivery service. Well done! They behaving the best deals online, one time I ordered online for delivery they brought my pizza late, and a day later in the mail I got a coupon for a free pizza saying sorry for the inconvenience of your last order. What other pizza would do that. Like really! For the love of god. Please add an order tracker. “On its way” doesn’t cut it when my order is 45 minutes late. I have no idea where your driver is and your rep didn’t seem to have any clue, either. I like this app. Does exactly what it should do. It keeps signing me out when I try to order so I have to order as a guest and can’t get any reward points. I wasted 30 minutes filling in the same order 5 times before I gave up and just checked out as a guest. Terrible app and, as if to mock me, the app showed me how many points I could have earned if I had signed in, after I placed my order as a guest. There also seems to be no customer service. WAY easier and faster than ordering online!! Very easy to navigate the app and it makes ordering so much easier. Oh yea that free pizza!! Great app. Very easy to use, great pizza. It's really easy to use - it wasn't but the update has made it almost intuitive. I love how easy it is to order pizza with this app! Very user friendly. I love this app. I like be papa johns. I love the pizza. Great app works as it should. My only complaint about the app is that there’s no option for paying with PayPal like on the website. I actually like the interface better than the desktop version because it’s so easy to use and navigate. Pizza’s cooked with care !! As a Louisvillian I do have a special spot in the Heart for Papa's. But it is not misplaced. Better ingredients, Better Pizza. Papa Johns. Thanks for all the years of good pizza. Love the app. So easy to use! Great pizza and fast ready time ! This app does not work! Literally went to dominos because the app wouldn’t work. Sorry bout it. Somewhat kluncky but overall good.